Boeing, a superpower of the aviation world, is in the midst of a profound crisis. A brand new 737-Max 8 crashing after a new system on the modified aircraft apparently malfunctioned is, if investigators initial findings are confirmed, a disaster. All the evidence is pointing towards a second case of the same model of plane apparently suffering a similar fate, just five months later, and that makes this a whole lot worse. While the investigations into the crash are not yet complete, the problems for Boeing are mounting. What could be to blame for the crashes? It's believed that erroneous data from that single sensor activated an anti stall system on the Lion Air flight, pushing the nose of the plane down shortly after take-off. Media captionBoeing 737 crashes: What went wrong? 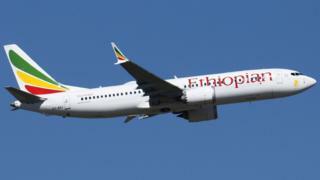 The evidence suggests that could also be the case for Ethiopian Airlines flight 302. The automatic system was also designed to reactivate repeatedly, so when the pilots on Lionair flight 610 pulled the nose of the plane back up, the stall mechanism kicked-in again, pushing the nose of each aircraft back down. Flight ET 302 also nose-dived repeatedly and, according to the preliminary report into the crash, the pilots followed Boeing's procedures and that was not enough to regain control of the aircraft. For Capt Brady, author of the 'Boeing 737 technical guide', this saga presents a long list of issues which need to be looked at. "The level of automation of the aircraft, the behind the scenes systems, the risk analysis processes gone through at Boeing, the oversight by the regulator, the conversion training, the level of training generally, the manual flying skills of the crews. All of it needs to be reviewed in light of these accidents," he says. What could the legal implications be for Boeing? Multiple inquiries are underway. At least two lawsuits have been filed and more are likely. The latest of those two lawsuits has been filed by Ralph Nader. His niece's daughter, 24 year old Samya Stumo, who was working in the global health sector was one of 157 people killed on board flight ET 302. "She had leadership written all over her, she had compassion in an intellectually rigorous way." "She was driven to save lives and we'll never know how many lives have been lost because she's not helping in a systemic way for the next 50 years." Mr Nader ran several times for the US presidency, he's an experienced lawyer and has form at taking on big companies and is threatening to take legal action against Boeing. Last week a suit was filed in a Chicago federal court by the family of one of the victims of the Ethiopian crash, Jackson Musoni, a citizen of Rwanda. It alleges that Boeing had defectively designed the automated flight control system. What will Boeing be doing to try to address the problem? Multiple investigations will pore over the certification of the Max and its new anti-stall system. According to one former test pilot at Boeing there were thousands of hours of flight time during the test programme which went on for more than a year. He says there will be "terabytes of data" from test flights which can now be examined. "Nothing is done by a rogue pilot", the former Boeing employee said. "If anything we overkill, when going over things in group discussions." Boeing says it will install an extra warning system in the 737 Max 8 and is revising the company's pilot training plans. But the sign-off process this time around will be more rigorous and aviation regulators from outside the US will be much more active in the process. The protocol of other regulators accepting the Federal Aviation Administration's judgement will not necessarily apply. Europe's Aviation Safety Agency, EASA, will, on this occasion, make up its own mind before the Max is deemed safe enough to fly again through European skies. What could be the financial fallout for Boeing? With hundreds of 737-Maxs grounded worldwide and thousands of orders now on ice, with some of those possibly in jeopardy, the commercial impact of this episode is still evolving. Airlines whose aircraft remain grounded will want financial compensation. The potential bill for Boeing will grow exponentially if this drags into the summer months, when flight schedules and therefore cost implications suddenly increase. That said, Boeing is a commercial giant. "Boeing has a large enough balance sheet. It won't really hit them", says Peter Lemme, a former flight engineer at Boeing. But he believes Boeing's reputation "is tarnished by this." In his opinion, getting the Max back in the air won't be straight forward. "There's a little bit of uncertainty now over what it will take to satisfy the regulators." And in the world of aviation, everything comes down to safety. For Capt Chris Brady, an experienced 737 pilot, this is a watershed moment. "It's the processes which are flawed," he says. "It could apply to any manufacturer anywhere and I'm quite sure Airbus will be looking at their own processes in light of this and asking, could this happen to us?" Boeing has insisted that safety has always been its number one priority.